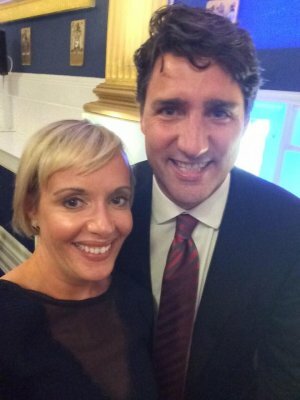 Dr Julie Rodgers (French, Maynooth) was recently invited to attend the State dinner at Dublin Castle on 4th July in honour of the Canadian Prime Minister’s, Justin Trudeau, official visit to Ireland. Dr Rodgers is a specialist in Quebec literature and the current president of ACSI (Association of Canadian Studies in Ireland). Ottawa, June 11, 2017 - The International Council for Canadian Studies (ICCS) is pleased to announce that the Governor General’s International Award for Canadian Studies was presented to Professor maeve Conrick during the ICCS cocktail held at the University of Ottawa. Each year, this award honours a researcher who makes an important contribution to the international development of Canadian studies. Ottawa, March 8, 2016 - The International Council for Canadian Studies (ICCS) is pleased to announce that the Governor General’s International Award for Canadian Studies will be presented to Alain-G. Gagnon next June 11th during the ICCS cocktail to be held at the University of Ottawa. Each year, this award honours a researcher who makes an important contribution to the international development of Canadian studies. Although Sheila Watson’s The Double Hook has been widely celebrated as a masterpiece of Canadian modernism and as a source of inspiration for numerous Canadian writers, it has perhaps not received its critical due, particularly in recent years. North York, May 27, 2013: The University of Toronto Press is pleased to announce the addition of International Journal of Canadian Studies to the UTP publishing program, joining a group of distinguished learned journals. The international conference entitled “Meeting Places” will take place in Halifax, Nova Scotia and Sackville, New Brunswick from September 18-21, 2013. This international Canadian studies conference explores place-based communities and cultures. Proposals are invited from those engaged in the study of Canada in all disciplines or research areas for papers that address the conference themes from multiple perspectives. Propositions have to be sent by October 10, 2012. The Presidents of the International Council for Canadian Studies from around the world write to express our deep concern about the decision of the Department of Foreign Affairs to abolish the Understanding Canada Programme. It is with regret and sadness that we are notifying you of the decision made by the Department of Foreign Affairs and International Trade Canada (DFAIT) Authorities to abolish the Understanding Canada-Canadian Studies Program. The ICCS Secretariat will have until March 31, 2013 to close the books, prepare final reports, communicate with grant award holders, etc. Nevertheless the AGM Meeting will take place in May at DFAIT as previously scheduled where we will have the opportunity to discuss this terrible ministerial decision taken by the Canadian Government. Missions abroad are in the process of communicating the bad news to all Associations and Canadian Studies Partners. We were also advised that the program of the Foundation for Educational Exchange between Canada and the United States (Fullbright program) which was under the responsibility of the Understanding Canada unit will not be affected by this decision. At this time the Executive Committee and Executive Director of ICCS are formulating an action plan to preserve ICCS. We will be in touch with details as soon as possible. AFEC (Association française d’études canadiennes), CENA (North American studies at Université Libre de Bruxelles) and ENCS (European Network for Canadian Studies) will be presenting the international conference L’internationalisation des études canadiennes : quelle utilité pour le Canada? (The internationalisation of Canadian Studies: usefulness for Canada?). 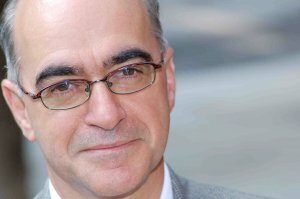 The conference will be held in Paris from May 3 to 4, 2012 in honour of Professor Jean-Michel Lacroix. The International Council for Canadian Studies (ICCS) is pleased to announce that the Governor General’s International Award for Canadian Studies will be presented to Simon Langlois next May 26th during the ICCS banquet to be held in Ottawa. Each year, this award honours a researcher who makes an important contribution to the international development of Canadian studies. ICCS recently participated in the GKS 2012 conference held in Grainau, Germany. ICCS wishes to congratulate the conference organizers for their efficiency and hopes this yearly gathering of German-speaking Canadianists will continue to be a tradition for years to come. ICCS is pleased to announce the nominees for its 2012 awards. 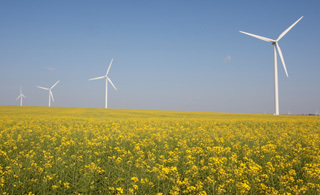 The Central European Young Canadianists are organizing a summer school on the theme “Canada and the Environment – An Interdisciplinary Approach”, which will take place from June 23 to July 1, 2012 in Telc (Czech Republic). Applications must be submitted by April 10, 2012. More information: http://bit.ly/GG83un. Written in Serb, Bojan Bosiljcic’s work presents a 30-year retrospective of the Academy of Canadian Cinema and Television’s Genie Awards. The author brings together numerous interviews with nominated actors and screenwriters, as well as film reviews and many illustrations. The volume is the only one ever published that looks at the three decades of the Genie Awards. The Understanding Canada Program of Foreign Affairs and International Trade (DFAIT) has been selected as a finalist for the 2011 Premio Venezia. Organized by the Italian Chamber of Commerce in Canada, the Premio Venezia Awards honor excellence in collaborations between Quebec and Italy. Whether through scientific research projects or sharing expertise and know-how between institutions and companies, collaboration and synergy have always been the foundation for any winning strategy. The 2011 award recipients will be announced during a special award ceremony on February 1st, 2012 in Montreal (Quebec). In November 2011, ICCS Secretary Susan Hodgett and Treasurer Stewart Gill spent time in Ottawa promoting the organisation to major Canadian opinion formers. Susan and Stewart held a series of meetings with Parliamentarians and senior business figures in Ottawa about the importance of ICCS and of studying Canada worldwide. 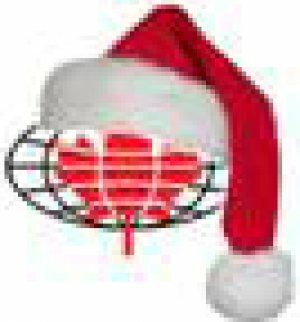 SEASON’S GREETINGS FROM THE ICCS! The holiday season is fast approaching in Ottawa and holidays are synonymous with a well-deserved rest! The ICCS Secretariat will therefore be closed from December 24th to January 3rd. The members of the Executive Committee and the ICCS staff wish to extend their sincere wishes for a festive winter solstice and an happy new year. DO YOU KNOW WHAT A CANADIANIST IS? 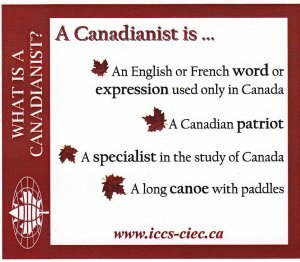 The ICCS recently created a quiz called "What is a Canadianist". Try it just for fun! The conference entitled “Native America Indigenous Self-Representation in Canada, the US and Mexico” will take place at the University of Groningen, the Netherlands on February 23-24, 2012. The conference will explore current research in a variety of fields, from linguistics to politics and from anthropology to literature, focusing on issues of self-representation in native communities in Canada, the United States and Mexico. Proposals for contributions (abstracts of no more than 250 words and a short biography) from Ph.D. candidates and researchers need to be received before November 15, 2011 at the following e-mail address: studenten.canada.let@rug.nl. Papers will be published after the conference. ACSI will host its XVIth Biennial Conference in Dublin on May 10-12, 2012. The theme for 2012 is: “Canada: Landscapes and Landmarks”. Papers should consider the portrayal and interaction of the land and the landscape in social, cultural and literary spaces of representation. Abstracts should be submitted before November 30, 2011 as a .doc or .rtf file to: ACSI2012@yahoo.ie. The 9th Graduate Student Conference in Canadian Studies will take place in Berlin from June 28 to 30, 2012. The conference entitled “Border – Borderlands – Borderline: Spaces of Encounters in Canadian Studies” aims at exploring the issue of borders in Canadian culture in general and in particular. The conference organizers look forward to contributions from all academic disciplines that address concepts, realities and perceptions of borders in relation to Canadian culture and life. This ICCS Award is designed to recognize and promote each year an outstanding PhD thesis on a Canadian topic that contributes to a better understanding of Canada. The thesis has to be written by a member (or one of his/her students) of a Canadian Studies Association or Associate Member of the ICCS. The PhD thesis, which has been successfully defended within the preceding two years, must be a scholarly monograph dealing mainly with a Canadian topic. Comparative works are eligible if the Canadian content is 50 % or more. The deadline for submissions is November 24, 2011. The Pierre Savard Awards are intended to designate exceptional books, which, being based on a Canadian topic, contribute to a better understanding of Canada. Every member association or associate member of the ICCS can submit their work. There are two categories: Book written in French or English and Book written in a language other than French or English. The deadline for submitting applications to the ICCS is November 24, 2011. The Governor General's International Award for Canadian Studies is intended for a scholar who has made an outstanding contribution to scholarship and to the development of Canadian Studies internationally. Nominee Awards may be citizens of any country and Posthumous or self-nominations are not accepted. Nominations must be submitted no later than November 24, 2014. 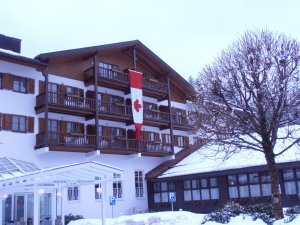 The Association of Canadian Studies in German-speaking Countries (GKS) is currently subsidizing an official E-learning program in Canadian Studies. Online courses will begin in October 2011 and will focus on literature, linguistics, Aboriginal studies, and geography. 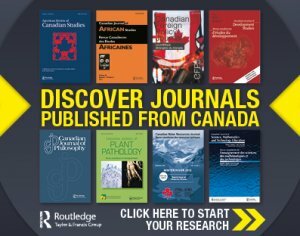 The ICCS Publishing Fund assists foreign Canadianists -who are members of a Canadian Studies Association or Associate Member belonging to ICCS- with the publication and distribution in Canada of scholarly monographs on the topic of Canada. The deadline for the submissions to the ICCS is November 24, 2011. The ICCS Postdoctoral Fellowships give the opportunity to young scholars, who have completed a doctoral thesis on a topic primarily related to Canada and are not employed in a full-time university teaching position, to visit a university with a Canadian Studies program for a teaching or research fellowship. The length of the stay will be of a minimum of one month and maximum of three months. During that stay, the student will receive $2,500 per month, plus the cost of a return airline ticket for a maximum of CAD$10,000. The application deadline is November 24, 2011. The ICCS Graduate Student Scholarships, worth a maximum amount of $3500, are bestowed each year to a dozen of students, helping them to spend 4-6 weeks at a Canadian university or research site, other than their own, doing research related to their thesis or dissertation in the field of Canadian Studies. All applications must be submitted to the ICCS by November 24, 2011. Anthony Cicerone, member of the Executive Committee of the Association for Canadian Studies in the United States (ACSUS), has been elected President of the New England-Canada Business Council, a position he previously held from 2000 to 2002. Cicerone has been Director of the Canadian Studies program at Bridgewater State University since 1989. Visit www.necbc.org for more information. The ICCS would like to remind you that the deadline for the Governor General’s International Award for Canadian Studies, the Pierre-Savard Awards, the Best Doctoral Thesis in Canadian Studies Award, the Publishing Fund, the Graduate Student Scholarships and the Canadian Studies Postdoctoral Fellowship is November 24, 2011. Celebrating the 30th anniversary of the International Council for Canadian Studies (ICCS), this collection offers an overview of the state of the art in various disciplines in Canadian Studies, such as political science, history, geography, sociology, public policy, linguistics, literature, as well as media studies and cultural studies. To order the book edited by Klaus-Dieter Ertler, Stewart Gill, Susan Hodgett and Patrick James, click here. 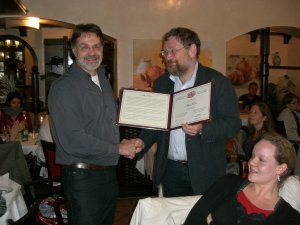 On June 25, at the Young Scholars’ Conference of GKS (Association for Canadian Studies in German-Speaking Countries), Albert Rau, a 1977 founding member of GKS, received the ICCS certificate of merit that Martin Kuester (University of Marburg) accepted on his behalf at the ICCS President’s reception of last May 28. ICCS certificates of merit, bestowed each year, honour the contributions of certain individuals to the development of Canadian Studies in Canada and abroad. The President emeritus of the AFEC, Jean-Michel Lacroix, received on July 14 the Insigne du mérite 2011 from the University of Montreal. Professor Lacroix teaches at the Université Paris 3 Sorbonne Nouvelle and is a previous president of the ICCS (1989-1991). The ICCS wishes to inform you that as of April 27, 2011, the Asociación Venezolana de Estudios Canadienses (Venezuelan Association for Canadian Studies, AVEC), founded in 1995, has changed its name to Red Venezolana de Estudios Canadienses (Venezuelan NetworkofCanadianStudies, REVEC). The International Council of Canadian Studies recently decided that its next Executive Committee meeting will be held in Ottawa on May 21-22, 2012, followed by its conference entitled “Cultural Challenges of Migration in Canada”, which will be presented on May 22-24, 2012. The Annual General Meeting of the ICCS will take place in the same city on May 25-26, 2012. Since the Annual General Meeting of May 27-28, the Canadian Studies Network (CSN-REC) has been welcomed as a new associate member of the ICCS. This past May 28, the annual banquet of the International Council for Canadian Studies took place in the Pearson room of the Lord Elgin hotel in Ottawa, preceded by a cocktail in the Lady Elgin room. The ICCS Annual General Meeting, which was held last May 27-28 at the Department of Foreign Affairs and International Trade Canada (DFAIT), brought together the majority of the ICCS Board of Directors, as well as a few observers in order to take stock of Canadian Studies. The 30th anniversary ceremony for the International Council for Canadian Studies and the reception of the president, Klaus-Dieter Ertler, were held during the evening last May 26 in the Skelton Lobby of the Department of Foreign Affairs and International Trade Canada (DFAIT). This past May 26, the International Council for Canadian Studies participated in a forum presented by the Department of Foreign Affairs and International Trade Canada (DFAIT)’s International Education and Youth Division on the evaluation of the three years of the Understanding Canada Program. On May 24-25, 2011 the Executive Committee of the International Council for Canadian Studies met to discuss the Board’s main orientations. Present at the meeting were Council President Klaus-Dieter Ertler, President Elect Patrick James, Secretary Susan Hodgett, Treasurer Stewart Gill, Executive Director Cristina Frias, Administrative Coordinator Lise Nichol and Financial Consultant Gaëtan Vallières. scholarships, grants and services for the new generation of Canadianists. The Facebook site will be the ideal place to exchange ideas, announce events, etc. related to Canadian Studies. To join, click here. The International Council for Canadian Studies (ICCS) is pleased to announce that its next conference will be held in Ottawa in May 22 to 24, 2012, again in collaboration with the Universities of Ottawa and Carleton. Proposals for twenty minute papers, to be presented in either English or French, are invited from disciplinary, multidisciplinary, or comparative perspectives on the theme of Cultural Challenges of Migration in Canada.